Driving out to this location, I was hoping that there would still be a deep layer of snow covering the Kansas dirt. I didn’t realize it would still be this much. The drift on the north side of this barn was easily three feet deep. Fortunately it was cold enough that the snow’s surface had frozen over and we were able to walk on top of the snow with out much worry of sinking in. The one thing I distinctly remember from this night was the bone-chilling wind. The wind chill that morning had to have been below zero. Needless to say, I was glad I was able to work most of my camera settings with my gloves on! This entry was posted on January 5, 2012 by ackfive. It was filed under 14mm 2.8, 5D mk II, FarmEx, Long Exposure, Night . Amazing light…love the motion in the snow! Nice one – love the stars on the backside of the barn. 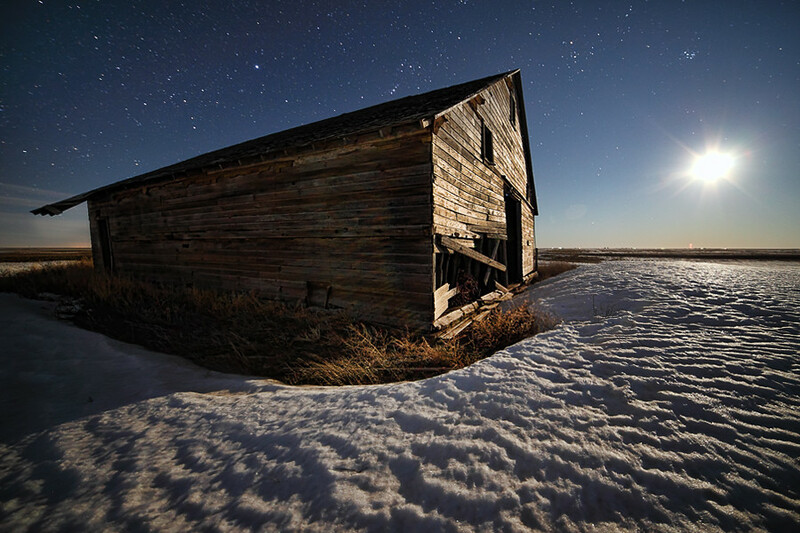 Awesome Scott, the moonlight reflecting off the snow really lit up this scene! Amazing moon light! I agree with Mike. Love the inferred motion of the snow! Awesome image Scott! Love how the snow seems to be moving at the bottom of the frame! Epic shot here man, pure magic! This is really cool man. What sorta settings did you use on this one? Thanks bud. Here is the Exif data. Ignore the 0.0 aperture and 50mm focal length. This was shot with a Rokinon 14mm and I’m sure the aperture was set at 2.8. because it is a manual aperture/manual focus, it doesn’t register right with the Exif data. Very cool! Great shot Scott.